A perfect bound 114 page magazine book focused on behind-the-scenes of the greatest horror and science fiction films of all time. Hundreds of rare photos (Jack Pierce, George Pal, etc.). Plus interviews: Ben Chapman, Ray Harryhausen, Ken Tobey. Publisher Ted Bohus! Carla Laemmle has led numerous lives. She appeared with Lon Chaney in The Phantom of the Opera, as was a passenger in the coach traveling the Borgo Pass in 1931's Dracula. This bio presents an intriguing portrait of a life lived in the strange place that is Hollywood. This work examines how and why horror films were censored or banned in the United Kingdom, and the part these actions played in ending Hollywood?s golden age of horror. CLICK IMAGE FOR DETAILS. 1935 hardcover edition of the Little Big Book CHANDU THE MAGICIAN. Photoplay of RETURN OF CHANDU. Lots of photos. Typical age tanning. Spine art missing, but spine still all intact. Amazing historical piece for movie and Lugosi fans. See images. Only one. By Ken Hanke. From his primitive nonseries beginnings through the well known Fox series of 44 films (1931-1949), here is the complete history of famous film detective Charlie Chan. 286 pages softcover. Photos. By J.J. Johnson. This work uncovers the cheap and challenging behind-the-scenes production secrets of the fantastic films of the 1950s. Special technical effects, visual effects, menacing makeup, stunts, and fantastic sets. CLICK IMAGE FOR DETAILS. By Tom Johnson and Mark A. Miller. 480 Pages. CLICK IMAGE FOR DETAILS. One of the few classic movie books of horror films that came out in the early 1970s. Ended up under the Christmas tree for many a monster kid! 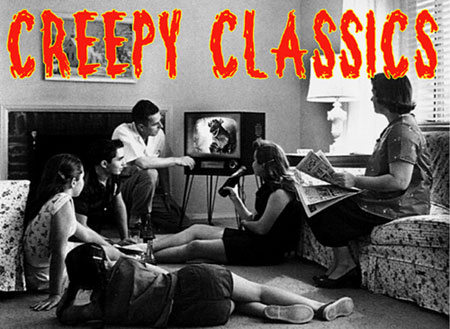 A detailed look at the cornerstone movies that are the foundation of classic horror. Great photos, big coffee table hardback with original dust cover. Known for his fantastic collaborations with Lon Chaney in numerous silents, and for directing the horror classic DRACULA and the still-controversial Freaks, Browning has been called ?the Edgar Allan Poe of the cinema.? CLICK IMAGE FOR DETAILS. A great look at ghosts and the supernatural in films. Examined with photo illustrations are classics like THE HAUNTING, THE INNOCENTS, THE UNIINVITED BLITHE SPIRIT, OUTWARD BOUND, CURSE OF THE DEMON, LEGEND OF HELL HOUSE, CARNIVAL OF SOULS and many more. Color Cover and photos. A great look at ghosts and the supernatural in films. Examined with photo illustrations are classics like THE HAUNTING, THE INNOCENTS, THE UNIINVITED BLITHE SPIRIT, OUTWARD BOUND, CURSE OF THE DEMON, LEGEND OF HELL HOUSE, CARNIVAL OF SOULS and many more. Edward D. Wood, Jr. has been called the "Worst Filmmaker in History." In this hilarious and reverential study, authors Andrew J. Rausch and Charles E. Pratt, Jr. investigate this claim while providing in-depth looks at the 29 existing films written and/or directed by Wood. Photos! By Hank Davis. Lots of photos/poster reproductions. Let's nod our heads in appreciation, at what these skilled professionals have accomplished, often under very trying conditions and with low budgets. From Zorro to the Phantom and everything in between! This unique collection contains classic stories and extracts by established masters of horror such as Bram Stoker, M R James and Sheridan Le Fanu. So prepare to be thrilled, and chilled, as their bloodthirsty imaginations take you on a journey of unimaginable terror. Illustrated in color. All classic horror fans MUST have this book in their collection! It's one of those few "cornerstone books" from the 1970s on the subject. William Everson had sound assessments with great photos and covers important popular and RARE films in the genre. New, excellent condition. 248 pages! Wow! A great, great book. First edition from 1970. Traces the history of film, film collecting and a great instructional on 16mm film collecting, protecting, slicing and storing. Packed with rare film photos. A real gem of a book for fans of classic film and 16mm film collecting. Softcover by Bob Michelucci. Reference guide to monster magazines. Cover by Jack Davis. Photo reference guide to Horror, Sci-fi and Fantasy magazines....From FAMOUS MONSTERS to FILMFAX to THE MONSTER TIMES, Charlton Mags and much, more. 215 pages. Used, but very good condition! A comprehensive look at the comedy-horror movie genre, from the earliest stabs at melding horror and hilarity from THE BAT in 1926 to the Abbott and Costello meeting Frankenstein?s Monster. CLICK IMAGE FOR DETAILS. The first part of this coffee-table sized book gives an overview of Vincent Price's life, as well as his career. Vincent Price - "You only get one time around, so why waste a minute of this glorious life?" The remainder of this book discusses every feature film connected with Vincent Price. The Counterfeit Man and other stories by Alan Nourse. Scholastic book of science fiction issued in 1967. Good shape, Name on inside front cover. Classic Scholastic! By Tom Weaver, David Schector and Steve Kronenberg. The Gill Man and his film career (CREATURE FROM THE BLACK LAGOON, REVENGE OF THE CREATURE, CREATURE WALKS AMONG US). Hour-by-hour production histories, cast bios, music, script-to-screen comparisons, in-depth interviews and photos. John Stanley's 580 page book, reviews horror, fantasy and science fiction films. Details, stars, ratings. "The Leonard Maltin of horror!" Used paperback, binding solid. Packed! By William Schoell. This work offers a critical, colorful and informative examination of different types of monster movies, spanning the silent period to today. 214 pages - hardcover. Photos! In 1954, an expedition found what seemed to be a missing link in the evolutionary chain: an ancient, immensely powerful amphibian creature. Scientists tried to tame it, break its will, and even change its very being with surgery and torture, but the beast rebelled.. 301 page novel. A companion graphic novel to the Stephen King movie CREEPSHOW. It features the art of Berni Wrightson in the classic old EC horror comic style of the 1950s. Gruesome, ghoulish fun. This has become a collector's item among fans of EC horror comics. New with only the slightest scratches on cover. New, full color! This volume collects four different story lines involving the Earth-One Justice League of America (the most familiar DC stars such as Superman, Batman, and Wonder Woman) and the Earth-Two Justice Society of America (older heroes). Retro fun! The cover of this collection summarizes the content fairly well. This is the set that starts to introduce the other earths of the multiverse. Classic DC Comic characters both old and new. From the 1970s comic books! Full color. The world of horror and monster collectibles! Model kits, board games, paperback tie-in novels, coloring books, masks, toys, collectibles! Universal, Hammer, Godzilla Dark Shadows merchandising through the decades...it's here! 136 pages of color photos, ad images and descriptions! An impressive collection of Lovecraftian tales intended to transcend what have become the familiar tropes of the genre, and I think it's safe at this point to consider the Cthulhu mythos a genre unto itself. A strong collection with consistently good writing. Recommended. Tragedy and Disaster Behind the Movies chronicles the troubled production tales of numerous Hollywood films. It's a must-read for any movie fan who loves behind the scenes stories of Hollywood movie-making. Softcover book. A Scholastic book from 1979 by Margaret and Eve Ronan. A history of vampire lore and vampires in popular culture. Photos from the films...Universal movies, Hammer movies and more. Used, but in good shape, name in pen on the inside front page and bookstore stamp. 89 pages.